First Citizens closed at another 52 weeks’ high on Friday. 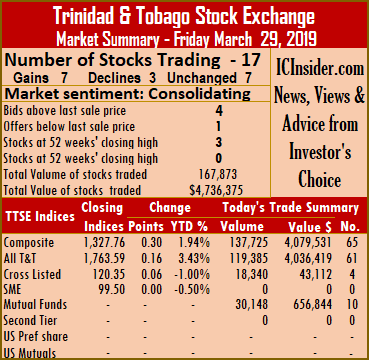 Three securities closed at 52 weeks’ high in trading on the Trinidad & Tobago Stock Exchange on Friday as 17 securities changed hands, as was the case on Thursday. Volume traded was greater than on Thursday but with only slightly more monetary consideration. 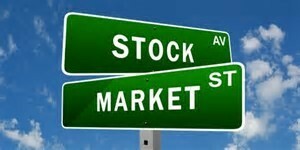 Investors exchanged 167,873 shares for $4,736,375, compared to 117,680 shares for $4,566,233 on Thursday. At close of the market, with 7 stocks advancing, 3 declining and 7 remaining unchanged, leading the Composite Index rose 0.30 points to 1,327.76. 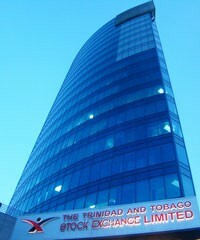 The All T&T Index gained 0.16 points to 1,763.59, while the Cross Listed Index inched 0.06 points to close at 120.35. IC bid-offer Indicator| The Investor’s Choice bid-offer ended at 4 stocks with bids higher than their last selling prices and 1 with a lower offer. At the close of the market, stocks ending trading with gains| Calypso Macro Index Fund rose 5 cents in trading 1,388 shares at $14.50, Clico Investments gained 15 cents and closed at a 52 weeks’ high of $22.15, with 28,760 stock units changing hands. 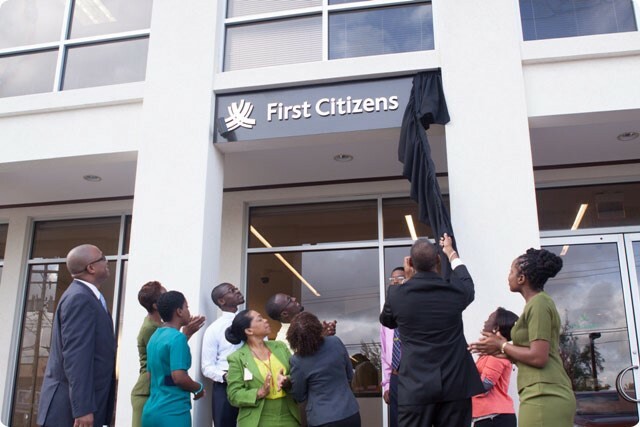 First Citizens added 25 cents to end at ended at a 52 weeks’ high of $36, after exchanging 1,595 shares Prestige Holdings increased by 5 cents and ended at $7.60, trading 2,500 units. Sagicor Financial rose 10 cents and settled at $8.80, after exchanging 200 shares, Scotiabank closed with a gain of 8 cents at $63.59, with 17,565 stock units changing hands and West Indian Tobacco climbed $2.59 and ended at a 52 weeks’ high of $98.75, with 315 stock units changing hands. 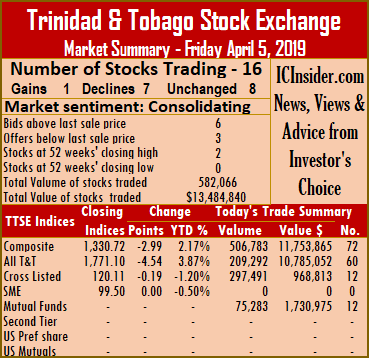 Stocks closing losses| Guardian Media fell 20 cents and settled at $14.80, after exchanging 6,300 shares, Guardian Holdings closed with a loss of 25 cents at $18, with 1,000 units changing hands and Trinidad & Tobago NGL shed 23 cents and ended at $30.27, trading 50,739 units. Stocks closing firm| Grace Kennedy ended at $3.25, with 6,000 stock units changing hands, JMMB Group settled at $1.80, after exchanging 12,140 shares, Massy Holdings closed at $53.40, after exchanging 3,549 shares, National Flour ended at $1.65, in exchanging 200 units. Point Lisas concluded trading at $3.45, with 26,298 stock units changing hands, Republic Financial Holdings completed trading at $119, after exchanging 7,392 shares and Trinidad Cement closed market activity at $2.55, in exchanging 1,932 shares. 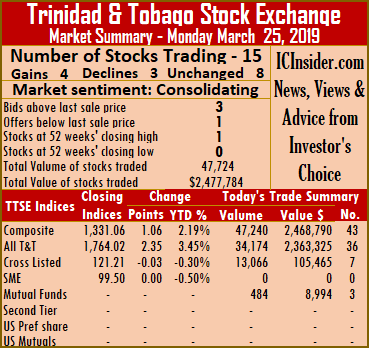 The number of securities trading on the Trinidad & Tobago Stock Exchange on Monday dropped to 15 securities compared to 19 trading on Friday. At close of the market, 4 securities gained, 3 declined and 8 remained unchanged and Massey Holdings ended at new 52 weeks’ high. 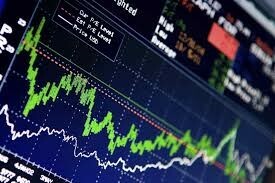 The Composite Index rose 1.06 points to 1,331.06. 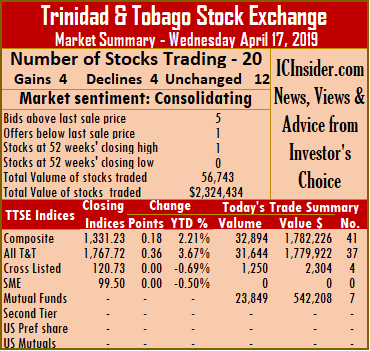 The All T&T Index gained 2.35 points to 1,764.02, while the Cross Listed Index shed 0.03 points to close at 121.21. Trading resulted in a mere 47,724 shares valued $2,477,784 compared to 497,591 shares at a value of $8,031,185 changing hands, on Friday. IC bid-offer Indicator| The Investor’s Choice bid-offer ended at 3 stocks with bids higher than their last selling prices and 1 with lower offers. At the close of the market, stocks ending trading with gains| Agostini’s ended trading of 360 shares with a rise of 3 cents to $23.33, First Citizens finished 4 cents higher to settle at $35.65, after exchanging 242 shares. Massy Holdings jumped $1.99 to close at a 52 weeks high of $55, trading 800 shares and Trinidad & Tobago NGL gained just 1 cent and completed trading of 12,713 units.at $30.26. Stocks closing losses| Clico Investments shares fell 30 cents and ended at $21.40, with 280 stock units changing hands, Sagicor Financial closed with a loss of 10 cents at $8.80, after exchanging 7,296 shares and Unilever Caribbean shed 10 cents and closed at $26, trading 1,872 shares. 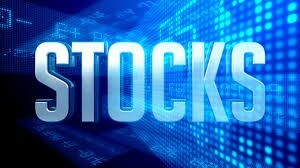 Stocks closing firm| Angostura Holdings ended trading at $15.80, with 25 stock units changing hands, Calypso Macro Index Fund traded 204 shares to close at $14.45, First Caribbean International Bank traded of 4,648 units at $8.35, JMMB Group closed at $1.80, after exchanging 1,122 shares, Point Lisas ended at $3.45, with 289 stock units changing hands. Republic Financial Holdings settled at $118, after trading 11,814 shares, Scotiabank ended at $63.51, with 3,560 stock units changing hands and West Indian Tobacco closed at $96.06, with an exchange of 2,499 stock units. 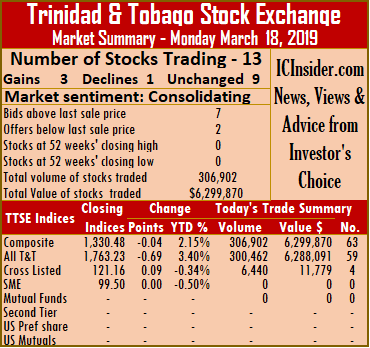 Market activity on the Trinidad & Tobago Stock Exchange ended on Monday with trading in 13 securities against 12 on Friday, with 3 advancing, 1 declining and 9 remaining unchanged. At close of the market, the Composite Index lost 0.04 points on Monday to 1,330.48. 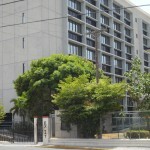 The All T&T Index declined 0.69 points to 1,763.23, while the Cross Listed Index rose 0.09 points to close at 121.16. Trading ended with 306,902 shares at a value of $6,299,870 changing hands, compared to 155,257 shares at a value of $2,877,840, on Friday. IC bid-offer Indicator| The Investor’s Choice bid-offer ended at 7 stocks with bids higher than their last selling prices and 2 with lower offers. 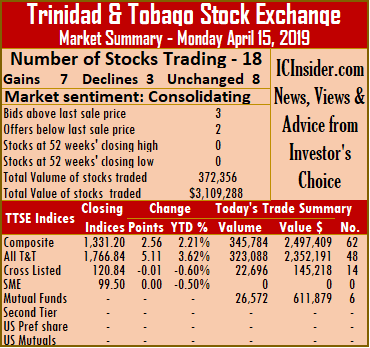 At the close of the market, stocks ending trading with gains| Ansa Mcal rose 2 cents and completed trading of 18,191 units, at $55.02, Sagicor Financial added 35 cents and concluded trading at $9, after exchanging 60 shares and West Indian Tobacco increased 1 cent to $96.03, with 5,207 stock units changing hands. 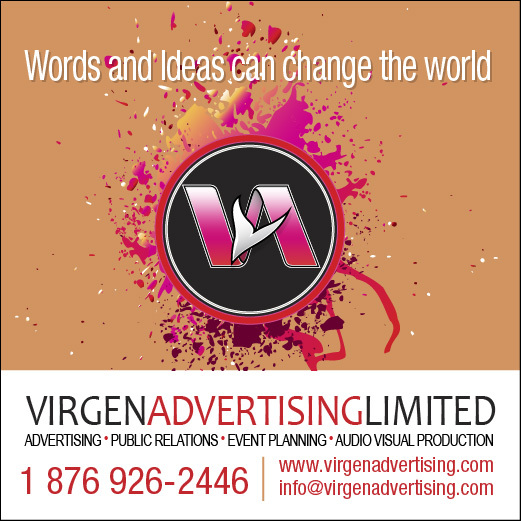 Stocks closing losses| Scotiabank fell 8 cents and ended at $63.51, with 26,912 stock units changing hands. Stocks closing firm| Angostura Holdings ended at $15.80, with 62,895 stock units changing hands, First Citizens settled at $35.51, after exchanging 2,575 shares, Guardian Holdings completed trading of 5,893 units at $18.25. JMMB Group exchanged 6,380 shares at $1.76, National Flour completed trading of 9,637 units at $1.65, Point Lisas ended at $3.45, with 10,000 stock units changing hands. Republic Financial Holdings settled at $120, after exchanging 1,344 shares, Trinidad & Tobago NGL completed trading 46,279 units at $30 and Trinidad Cement settled at $2.55, after exchanging 111,529 shares. 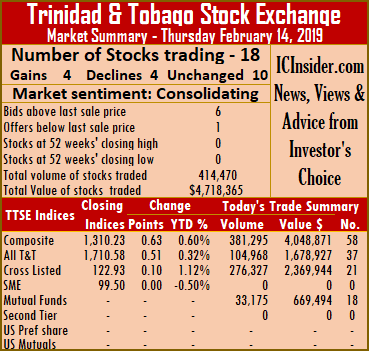 Market activity on the Trinidad & Tobago Stock Exchange ended on Tuesday with trading in 15 securities against 15 on Monday, with 4 advancing, 2 declining and 9 remaining unchanged. At close of the market, the Composite Index gained 0.47 points to end at 1,309.29. 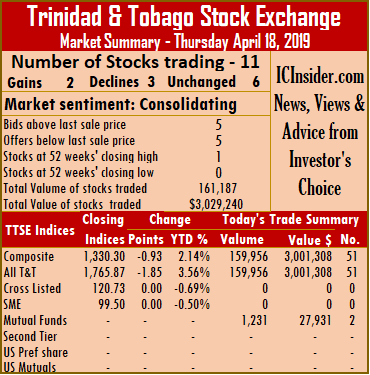 The All T&T Index rose 0.86 points to 1,708.41, while the Cross Listed Index inched 0.01 points higher to close at 122.98. Trading ended with 255,808 shares at a value of $2,783,173, compared to 299,658 shares on Monday valued at $4,351,193. IC bid-offer Indicator| The Investor’s Choice bid-offer ended at 4 stocks with bids higher than their last selling prices and 2 with lower offers. 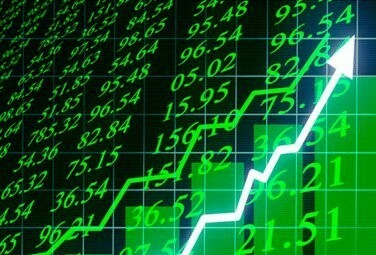 Stocks closing with gains | Ansa Mcal increased 20 cents and ended at $55.20, with an exchange of 60 units, First Citizens rose 5 cents to close at $34.10, after exchanging 500 shares, Sagicor Financial closed with a gain of 26 cents at $10, in exchanging 168,000 shares and Trinidad & Tobago NGL gained 11 cents and ended at $29.61, with 3,928 units changing hands. Stocks closing with losses | JMMB Group share fell 1 cent and settled at $1.75, after trading 7,749 shares and Point Lisas shed 15 cents and ended at a 52 weeks’ low of $3.45, with 750 stock units changing hands. Stocks closing firm | Clico Investments concluded trading of 5,370 stock units at $20.16, First Caribbean International Bank ended at $8.50, with 1,078 units changing hands, Guardian Holdings ended at $18, trading 2,094 units, National Enterprises closed at $8, with an exchange of 2,000 stock units, Prestige Holdings ended at $7.35, with an exchange of 1,000 units. 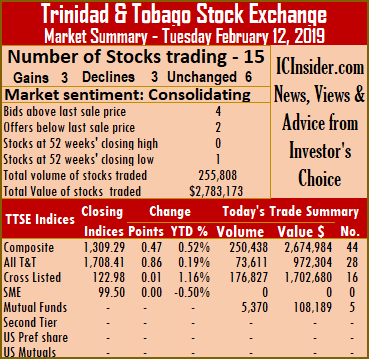 Republic Financial Holdings completed trading 1,437 shares at $107.80, Scotiabank concluded market activity at $63.64, with 615 stock units changing hands, Trinidad Cement completed trading at $2.50, after exchanging 56,654 shares and West Indian Tobacco ended at $95.50, with 4,573 stock units changing hands. 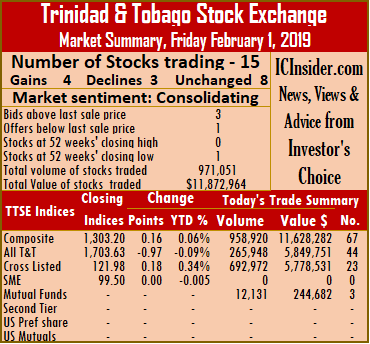 Trading volume picked on the Trinidad & Tobago Stock Exchange on Friday but the value of stocks traded was down on Thursday. The market closed with 15 securities changing hands, down sharply from 22 on Thursday, leading to 971,051 shares at a value of $11,872,964 changing hands, compared to 596,438 units valued at $12,414,789 on Thursday. IC bid-offer Indicator| The Investor’s Choice bid-offer ended at 3 stocks with bids lower than their last selling prices and just 1 with a lower offer. Stocks closing with gains| Grace Kennedy added 6 cents and completed trading at $3.06, with 21,132 stock units changing hands, Republic Financial Holdings increased 1 cent $107.52, after exchanging 17,968 shares, Sagicor Financial rose 1 cent and ended at $8.81, in exchanging 30,665 shares and Sagicor Financial added 1 cent and ended at $8.81, after trading 30,665 shares. Stocks closing with losses| Ansa Mcal ended trading of 1,120 units and lost 25 cents close at $55, Clico Investments lost 2 cents and ended at $20.17, with 12,131 stock units changing hands and Point Lisas traded with 100 shares with a loss of 5 cents to close at a 52 weeks’ low of $3.60. 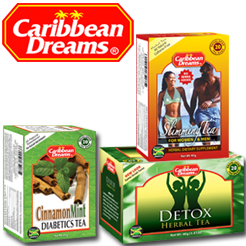 Stocks closing firm | Angostura Holdings ended at $16.05 with 6,000 stock units changing hands, First Caribbean International Bank completed trading of 577,149 units at $8.50, First Citizens settled at $33.82, after exchanging 2,177 shares, Guardian Holdings completed trading of 2,284 units at $18. 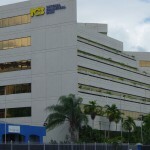 National Flour closed trading of 134,092 units, at $1.65, NCB Financial Group settled at $8.40, after exchanging 64,026 shares, Scotiabank ended at $63.65, with 12,957 stock units changing hands, Trinidad & Tobago NGL completed trading at $29.14, with an exchange of 88,850 units and Unilever Caribbean concluded trading at $25, after exchanging 400 shares.